Hi guys, I was just wondering, based on the events of D3, why barbarians and/or their druid cousins weren't trying to take back Arreat? Secondly, with such a prominent presence Magdha's Coven had in both Tristram and more so in Caldeum, why did the VizJaqtaar/Order of MageSlayers/Assassins do nothing about it? Well, iirc, the barbarians were not even stationed at mount Arreat prior to it's destruction. It's just a sacred mountain that is said to house the spirits of the ancients and the worldstone itself which is why it is guarded by the ancients themselves. I'm no lore expert but there is nothing to retake since what once was a mountain is now a gaping crater... They did however remained stationed in bastion's keep in order to attempt and repel any hellish invasions which were expected after the destruction of the worldstone. It's a Wizard short story released before the launch. I read it long time ago and it wasn't directly stated but probably the Sorceress from D2 was killed by a Assassin from Vizjaqtaar. As others have stated The Barbs really didn't inhabit Mount Arreat, they inhabited Bastions Keep and therefore didn't need to retake it plus without anything to retake it wasn't on their minds probably. The Druids are from Scosglen so they're kind of out of the picture here too. As for the Maghda thing, they probably tried but failed. remember you are the hero who defeats them, she is a strong and powerful witch but you are just that much stronger than she. Not even Death will save you from Diablo Bunny's Cuteness! Druids are cousins of the barbarians, originating from the line of Bul-Kathos so I thought they'd be at least emphatic about their cousins or have a cause to restore the natural balance of the Arreat region. I don't think Assassin's can fail against Maghda let alone her minions. I mean Natalya was legendary enough to have a set named after her and Bartuc got his own claw. The coven was very much prominent and there are a lot of magi at Caldeum worth watching. Yes, they are shrouded and secrecy and that could be used as a reason as to why they were seemingly absent. They didn't have to deal with the Coven directly like Natalya to the Zakarum. 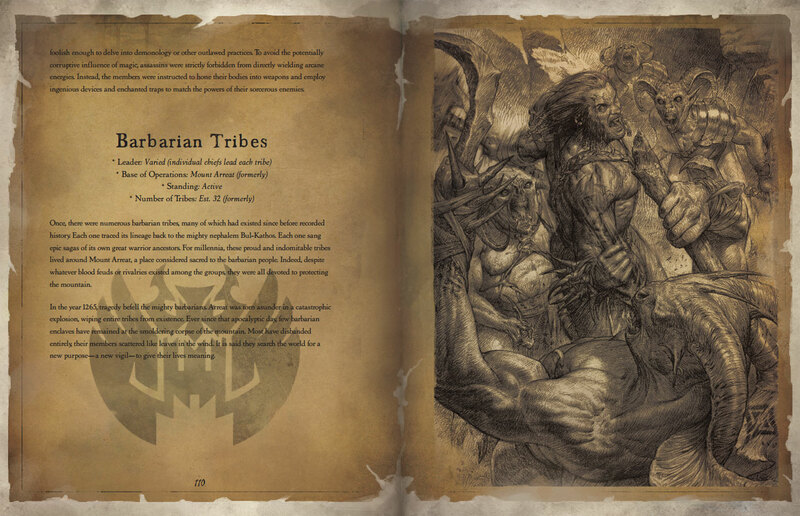 The preview from the book of Tyrael says many Barbarian tribes were completely wiped out when Mount Arreat was destroyed. They lived to protect Arreat, and since it was destroyed, many tribes disbanded and 'scattered like leaves in the wind' searching the world 'for a new purpose - a new vigil - to give their lives meaning. True, the barbarians may no longer give a damn. My stand on the Viz'jaqtaar remains though.